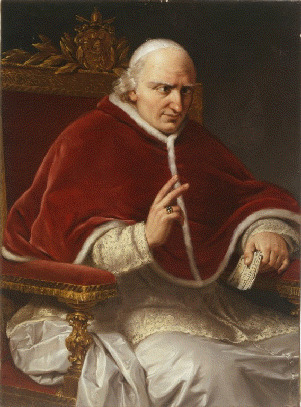 Pope Pius VIII (20 November 1761 – 30 November 1830), born Francesco Saverio Castiglioni, was Pope in 1829 and 1830. 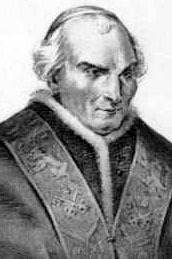 After the death of Pope Leo XII (1823–29), Cardinal Castiglioni was elected Pope in the papal conclave. As Pope Pius VIII, he initiated some reforms in the States of the Church. On 24 May 1829 he issued an encyclical, Traditi humilitati. Perhaps indicating that the current debate on religious pluralism was also occurring in his own time he condemned the "foul contrivance of the sophists of this age" that would place Catholicism on par with any other religion. We must also be wary of those who publish the Bible with new interpretations contrary to the Church's laws. They skillfully distort the meaning by their own interpretation. They print the Bibles in the vernacular and, absorbing an incredible expense, offer them free even to the uneducated. Furthermore, the Bibles are rarely without perverse little inserts to ensure that the reader imbibes their lethal poison instead of the saving water of salvation. On 25 March 1830, in the brief Litteris altero, he condemned masonic secret societies and modernist biblical translations. During his brief pontificate, the Catholic Emancipation occurred in the United Kingdom, and the July Revolution (1830) in France – after which he recognised Louis Philippe (1830–48) as the de facto king of France after the toppling of Charles X.
Pius VIII accepted the situation on mixed marriages between Protestants and Catholics in Germany, but opposed liberalising tendencies in Ireland and Poland. Pius VIII, pope from 1829 to 1830, who came of a notable family at Cingoli near Ancona, was born Francesco Xaviero Castiglioni on the 20th of November 1761. He studied canon law at Rome, became vicar-general at Anagni and later at Fano, and in 1800 was appointed bishop of Montalto. Because he refused the oath of allegiance to the Napoleonic king of Italy he was carried captive to France; but in 1816 his steadfastness was rewarded by his being created cardinal-priest of Sta. Maria in Trastevere; and this same year he was translated from the see of Montalto to that of Cesena. In 1821 he was made cardinal-bishop of Frascati, also grand penitentiary; and later he became prefect of the Congregation of the Index. In the conclave which followed the death of Pope Leo XII, Castiglioni, the candidate of France, was elected pope on the 31st of March 1829. He avoided nepotism, abandoned the system of espionage employed by his predecessor, and published an encyclical condemning Bible societies and secret associations. He held various high offices thereafter, including that of Major Penitentiary, and, after the death of Pope Leo XII (1823–29), was elected Pope in the papal conclave.